The coin bag is a little-known prop that allows you to perform some great coin magic. Think of it as an egg bag, or change bag but specifically for coins! It's a little bag with a mesh front that allows you to vanish, produce, change and otherwise manipulate coins in some pretty impressive ways. Craig Petty is the only magician that we've ever seen use a coin bag, and he uses it incredibly well. He has a tonne of uses for the bag and so far has released two DVDs using it. This one, Attack of the Bag comes with a free coin bag and the DVD has 9 tricks using it. The type of magic that you can perform with a coin bag is quite hands off. Coin magic pretty much always only happens in the hands or on the table, so this makes for a nice change of pace. Unlike most magic props of this nature, the bag isn't too camp looking so it should fit well into your act without too much of an image problem. 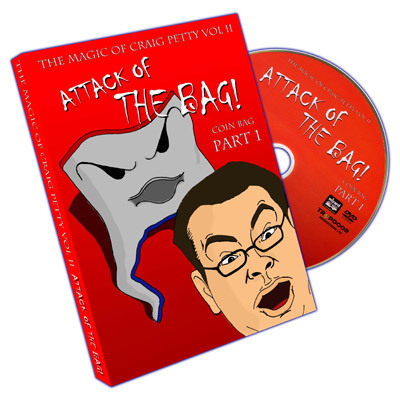 Like all of Craig's DVDs, this one is well produced and the material is well explained. Everything on the DVD is in the reach of an intermediate coin worker and we think you'll really enjoy playing with. The DVD comes with two coin bags and a whole lot of Petty loving (actually, we made up that last bit).